Building on the previous pitch identification work I did for Eric Gagne, let’s take a look at how he uses his pitches. Here are some strike zone charts showing where he locates his pitches against left-handed hitters and right-handed hitters. I’m experimenting with the formatting of these charts, so let me know if there are things I can do to improve that. 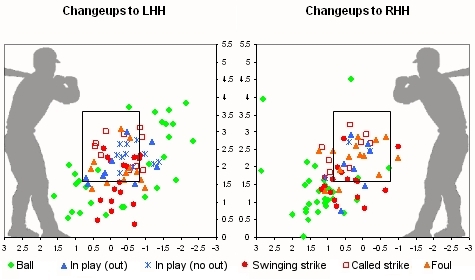 The graphics are a little small, but I thought it was more important to contrast the general patterns of lefty versus righty than to see the exact result for a specific pitch. Let’s begin with the curveball. 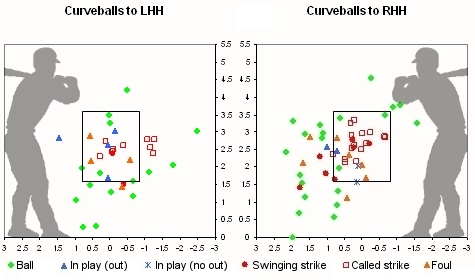 Gagne faces about an equal number of lefties and righties, so the first thing we can see is that he uses his curveball much more against righties (19% of pitches to RHH) than against lefties (11% of pitches to LHH). He works away from righties and in to lefties with the curve and has pretty good success getting righties to chase the curve down and away. Next, let’s look at fastballs. Gagne throws approximately equal numbers of fastballs to lefties (56%) and righties (51%). He likes to work away to both lefties and righties but seems a little more willing to come inside to lefties. He gets a lot of foul balls and contact in the zone with his fastball and, other than a few high pitches, not a lot of balls chased out of the zone. 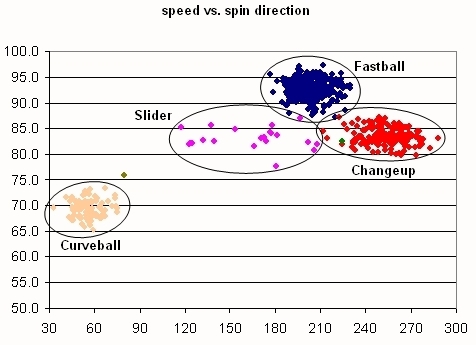 Gagne throws the changeup about equally to lefties (30%) and righties (25%). He clearly likes to keep his changeup down and away to both lefties and righties. It looks like he has pretty good success with that, but when he gets up in the zone with the change, it starts to get hit, particularly against lefties. We’ll see in a moment if the numbers bear that out, but the strike zone charts certainly look that way. Finally, let’s look at the sliders. Gagne doesn’t throw many sliders, 2% of pitches to lefties and 5% of pitches to righties. The few he throws to lefties are inside, same as with the curveball, perhaps moreso. With righties he works down and away with the slider, mostly missing the zone. It looks more like a show-me pitch than anything. It would be interesting to learn on what count he throws the slider, or any of the other pitches for that matter, but I haven’t compiled that information yet. Here are the results by pitch type and batter handedness in tabular format. CS=called strike, SS=swinging strike, IPO=in play (out), IPNO=in play (no out), TB=total bases, BABIP=batting average on balls in play (including home runs), SLGBIP=slugging average on balls in play (including home runs). For Strk% all pitches other than balls are counted as strikes. Clearly, my earlier hunch was right: Gagne’s changeup gets tattooed when he gets it up in the zone against lefties. Also, it does look like the slider is mainly a show-me pitch to righties. As the regular season ends and the playoffs approach, I’m looking at a few of the playoff-bound pitchers, and I want to share the results for one of those pitchers–Eric Gagne. I begin with identifying his pitch types, and as time permits, I’ll move on from there in further posts. I was able to identify four main pitch types that Gagne has thrown this year in the 39 games (of 54 total) for which we have PITCHf/x data recorded. 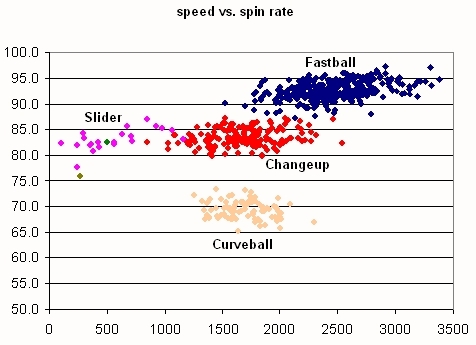 The graph I find most helpful in quickly identifying pitch types is pitch speed versus spin direction. For more detail on the methodology, read my post on Gagne’s teammate Jonathan Papelbon. 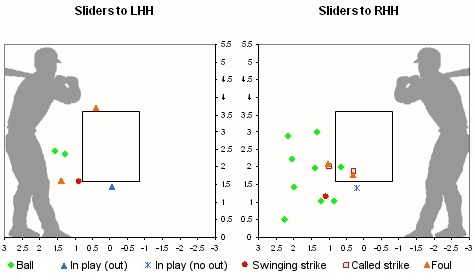 Gagne’s pitch mix is about 53% fastballs, 28% changeups, 15% curveballs, and 4% sliders. His fastball looks like a classic four-seamer delivered from about 1 o’clock and running 89-95 mph. I don’t see any evidence of a two-seam fastball, but he could probably hide a handful of them in there without me being able to spot them as a unique pitch. His changeup is interesting. He calls it a Vulcan changeup because of the V grip he uses, and there are some definite similarities to a split-finger or forkball pitch in terms of the significant sidespin, inclined about 50 degrees more than his fastball. Speed-wise his changeup ranges from about 80-87 mph. His other major pitch is a curveball, hitting about 67-73 mph with good topspin, and also thrown from about a 1 o’clock delivery. His occasional slider seems very inconsistent. It runs about 82-86 mph, but its spin axis is all over the place, ranging from 120 degrees (great sidespin) to 210 degrees (no sidespin at all other than that from the 1 o’clock delivery). 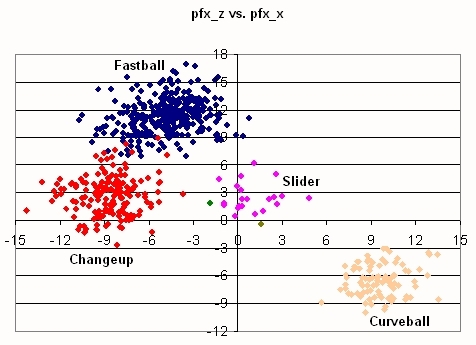 There are five pitches out of total of 601 in our PITCHf/x dataset for Gagne that I could not classify into the aforementioned four pitch types. Three of them appear to be data collection errors based on unrealistic release points, and I’ve eliminated them from the dataset. 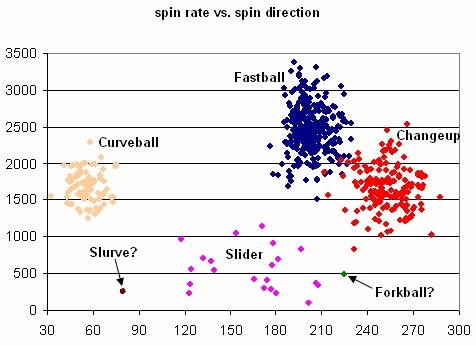 Before I discuss the other two pitches further, here are two additional graphs: pitch speed vs. spin rate and spin rate vs. spin direction. On these two graphs you can see two unidentified pitches as well as additional details about the four main pitch types. I’ve tentatively labeled the two unidentified pitches as a slurve and a forkball. The “slurve” pitch was thrown with a speed on the borderline between the curve and slider groupings. Its spin direction makes it look almost like a curve, but its slow spin rate makes it look almost like a slider. My best guess is that Gagne was attempting to throw a curveball but gave it a little more slider action than normal. 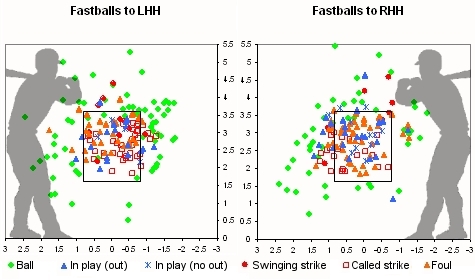 The pitch I’ve labeled “forkball” looks quite a bit like his other changeups except for the fact that it has a spin rate of only 500 rpm, and that’s reminiscent of a forkball or split-finger pitch. It doesn’t quite fit with the sliders given its spin direction of 224 degrees. We’ve already seen that Gagne is inconsistent with the amount of sidespin he gets on his slider, but this would be sidespin in the wrong direction for a slider. Given his changeup grip, it wouldn’t surprise me to see him throw a changeup that looks pretty forkball-ish. If you want to compare my data with the work of others, you can check out the player card that Josh Kalk generated for Eric Gagne using his clustering algorithm and data normalization. Below is my graph of vertical “break” vs. horizontal “break” with the pitch types labeled according to my classification. Josh’s algorithm lumps what I call sliders in with Gagne’s changeups. I realize the above graph is not presented in a terribly intuitive fashion in terms of what the vertical break, particularly, means. I have some ideas for helping to clarify that, but for now I’ll just present that graph as is. There is a lot more that can be done with this data, but I’ve found before that if I try to do it all in one fell swoop, I don’t publish anything, so I’ll start with this. Update: Part 2 of the series on Gagne.